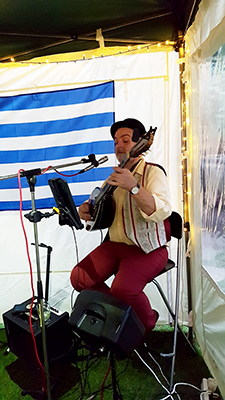 A “Greek in the Square” Members’ Evening was held in Earl’s Court Square Gardens on Saturday 8 September from 18:30 – 20:30. There were ouzo cocktails and Maria Xirou (ECSRA’s new Membership Secretary) provided an array of authentic Greek canapés. A team of volunteers from the Committee put up a fairy-lit marquee and Members were able to get to know each other to the accompaniment of the London Bouzouki Player (kindly sponsored by John D Wood).